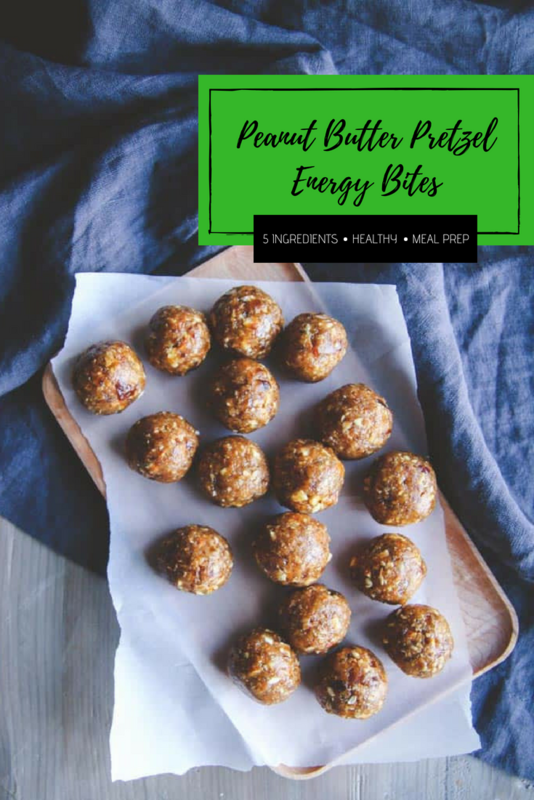 Energy bites are a great healthy snack, and these 5 ingredient peanut butter pretzel energy bites are some of the best I’ve ever made or had. They’re sweet, crunchy, delicious and seriously taste like candy! Lately I’ve been obsessed with making energy bites. 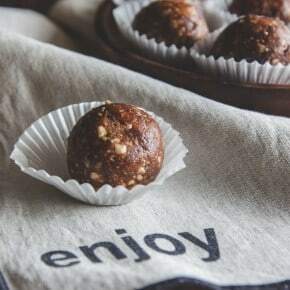 In the past I’ve made these coconut date energy bites (one of the most popular recipes on my site!) 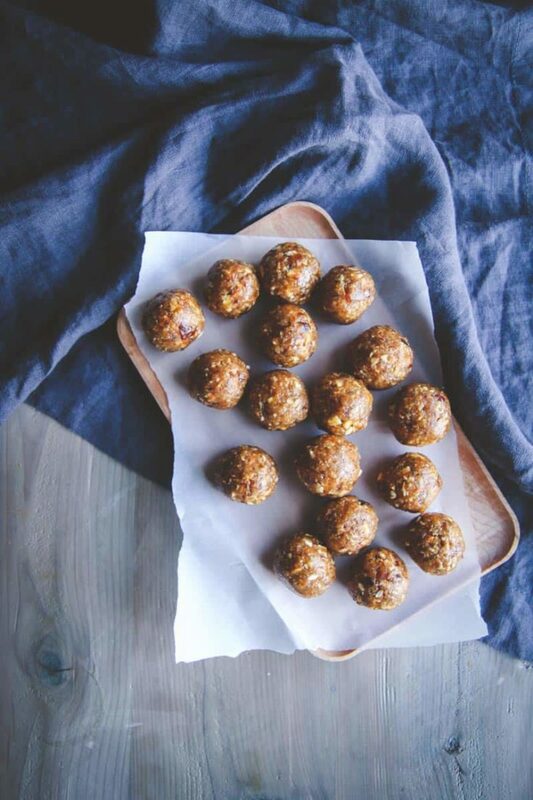 and these oatmeal cookie energy bites – I make them all the time. Just like my other energy bites, these also only have five ingredients, five ingredients is all it takes to make amazing energy bites (and they’re perfect for this weeks’ Five Ingredient Friday). When I’m meal prepping, I love making a batch of energy bites for the week ahead. As I was looking at what was in my pantry, I saw a crumpled up bag of pretzels that was almost gone. You know what I’m talking about…the bottom of a bag of pretzels…when there’s only a few whole pretzels left but a bunch of little pieces? Well, they’re perfect for making energy bites with! They add an amazing crunch to the energy bites. 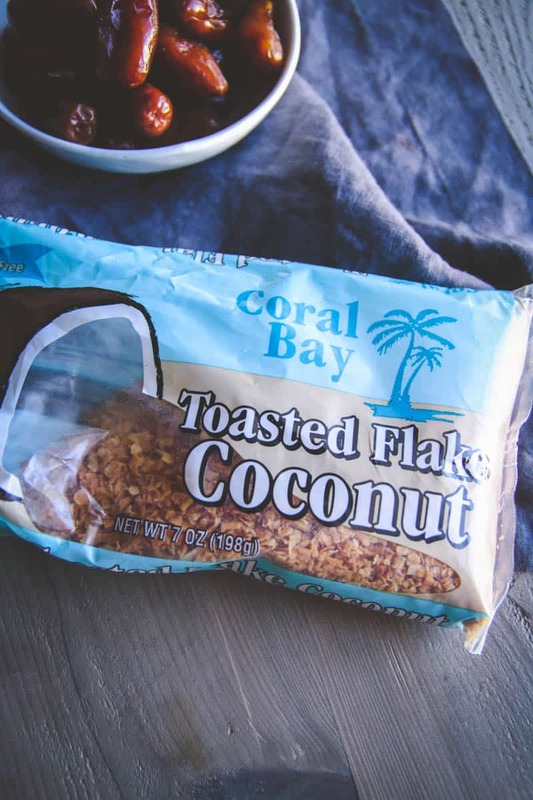 I also had some toasted coconut flakes that I found in the baking aisle at the grocery store. You could toast coconut flakes and use any kind of coconut you would like for this recipe, I loved the convenience of having the coconut flakes pre-toasted for me. 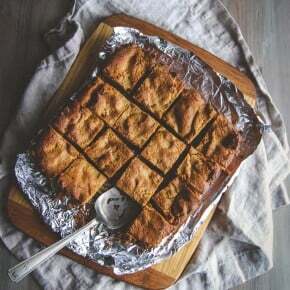 I use creamy peanut butter, but I’ve made these with natural peanut butter, almond butter and sun butter – they work great with any kind of nut butter! 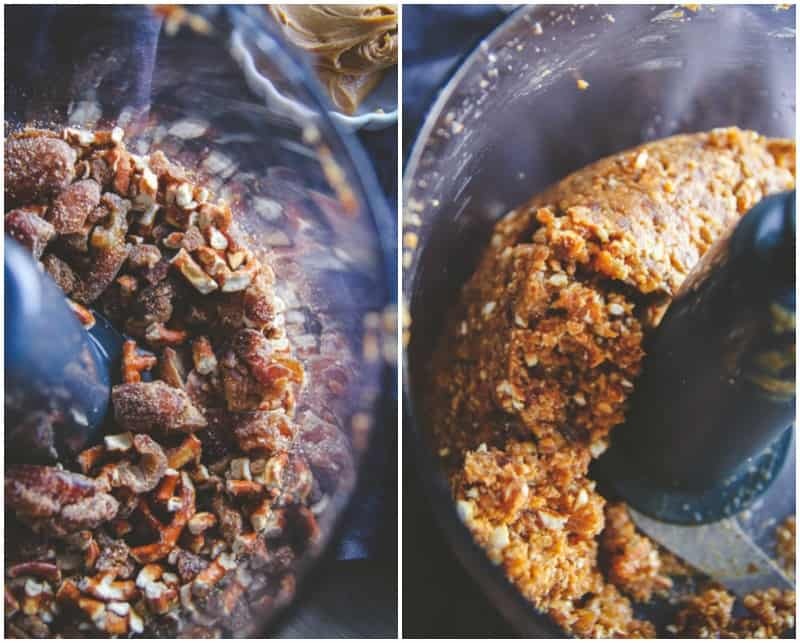 These 5 ingredient peanut butter pretzel energy bites are SO GOOD! 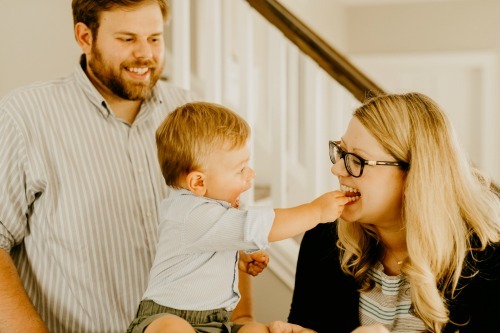 When I gave one to my husband to try, he said they tasted like candy, and I couldn’t agree more!! 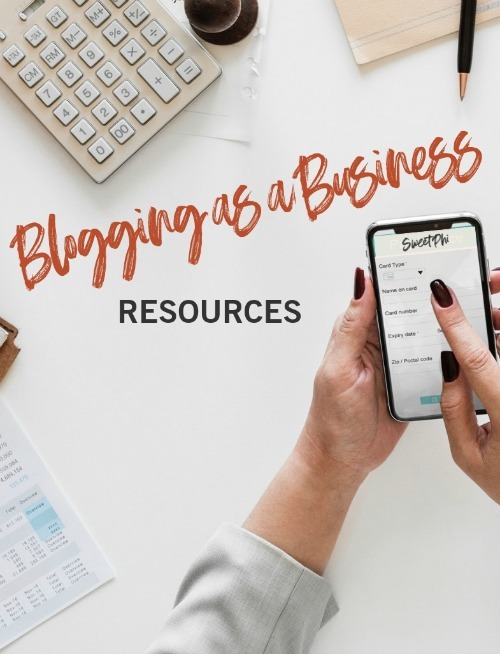 Whenever talking about energy bites, I like sharing tips – I want your energy bites to be amazing! In a food processor, process dates for 10 seconds, then add pretzels and process for another 10 seconds. 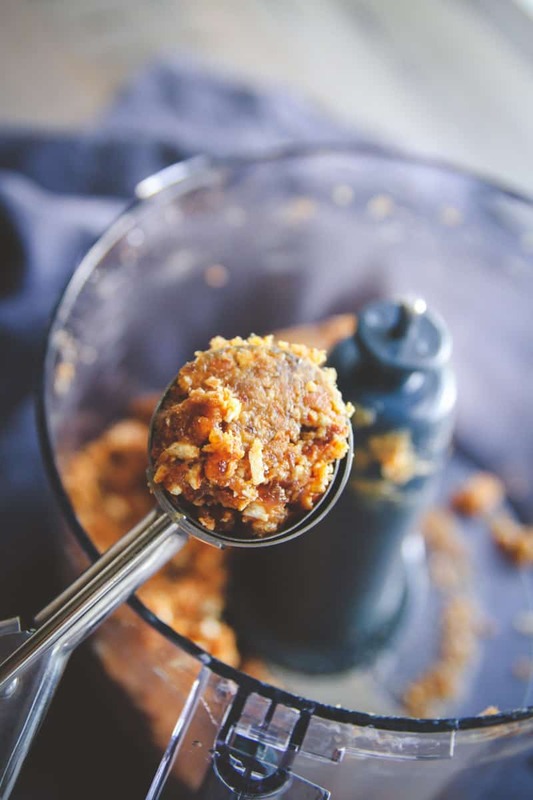 Add remaining ingredients: toasted coconut flakes, peanut butter, honey and water. Process for 10-30 seconds, until the mixture comes together and no large chunks of any ingredient remain - it should be soft to touch and but stick together, if not, add another 1/2 tablespoon of water and process. 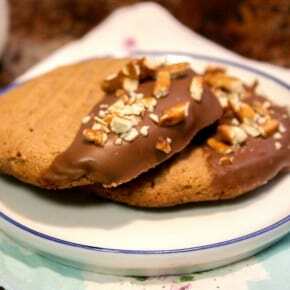 Using a tablespoon cookie scoop, scoop 1 tablespoon of the mixture and roll between hands to form a ball. Repeat with all remaining mixture, forming it into 1 tablespoon balls. Put in a container or bag and allow to cool for 1 hour in the refrigerator. Store in the refrigerator. 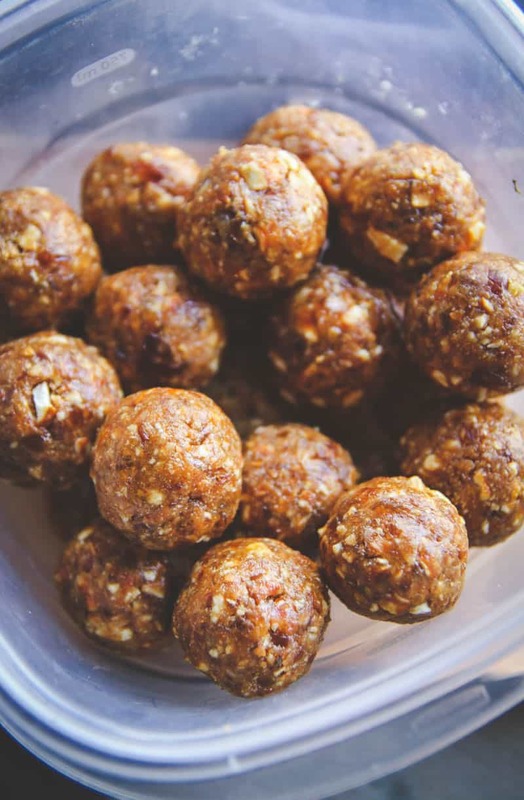 We love energy balls around here, I can’t wait to try these! Peanut butter plus pretzels? Yes please – and you know I love those 5 ingredient snacks. Makes life so much easier! I think you’ll love these easy and quick snacks, they’re so yummy and seriously taste like candy! Mmm these SOUND so good! 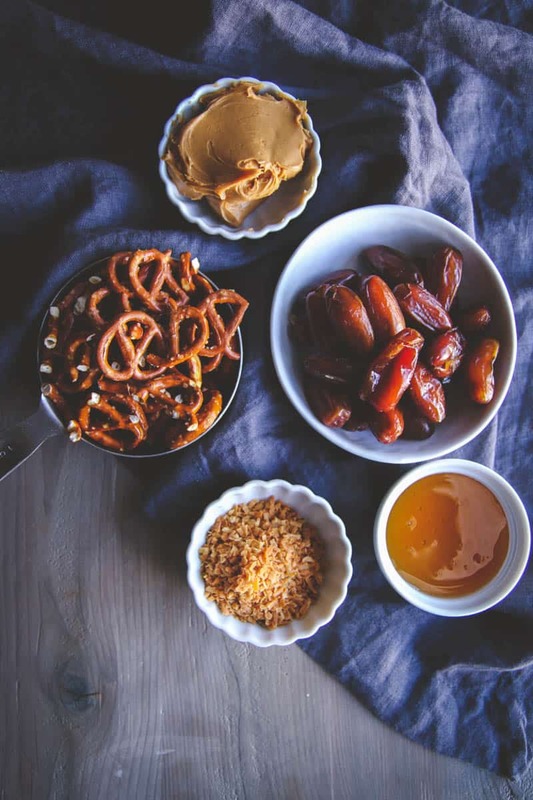 I may have to add some chocolate chips and make these Take 5-themed 🙂 love the salty pretzels paired with PB and those sweet dates. Yum! Oh how fun, take 5 themed would be so yummy, these bites, omg with or without chocolate, they’re soooo good! These sound and look delicious. My husband says he is not a big fan of coconut but every time I add them to something he raves and raves about them. I know we will both love these. Easy, peasy lemon squeezy! I love it. Pretzels, peanut butter, and coconut? Yes, please! Haha, exactly, easy peasy, these energy bites rock! Similar brain wave – I recently made little pretzel and peanut butter balls too, but I used protein powder!